Diagoras of Melos was an ancient Greek atheist, poet and sophist of the 5th century BC. Despite atheism existing for thousands of years, there is no large body of quality atheist poetry. For example, Wikipedia, which was founded by an atheist and agnostic, has no article on atheist poetry, yet it does have articles on Christian poetry and biblical poetry. In addition, the online book seller Amazon offers many books of Christian poetry as well as anthologies of Christian poetry (as of November 30, 2015 there were 61,064 search results for term "Christian poetry" at Amazon as far as soft cover and hard cover books being offered for sale to American consumers). On the other hand, the selection being offered at Amazon for atheist poetry was very limited (as of November 30, 2015 there were 123 search results for term "atheist poetry" at Amazon as far as soft cover and hard cover books being offered for sale to to American consumers and a great many of the books were not even books of atheist poetry). “ But it’s not the nihilism, the soullessness, the lack of poetry, the moral and physical ugliness, the shallow iconoclasm or the vainglory of atheists that bother me most. It’s the boringness. Is there anything more boring in the world than an atheist? 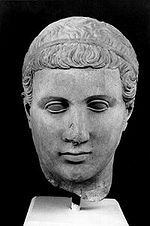 Diagoras of Melos was a 5th century B.C. Greek philosopher, poet, sophist and atheist. According to the book Greek Lyric Poetry: A Complete Collection of the Surviving Passages from the Greek Song-writers by George Stanley Farnell, "His position as a poet seems to be one of little prominence, and he probably abandoned his art for philosophical speculation." There is little information about Diagoras of Melos' life and his beliefs. And no atheist poems have been found written by him as far as the historical record. An atheistic school of thought can be found in ancient Indian thought and has existed from the time of the historical Vedic religion (2nd millennium B.C.). Using the above chronology of secular historians as far as the first appearances of atheists, the atheist population has had approximately six thousand years to compile a large body of quality atheistic poetry. Yet, atheists have not achieved this. Art, music and culture is often employed as means of evangelism and/or serve as an means of introduction to a religion/worldview. According to Wikipedia, which as noted above was founded by an atheist an agnostic, "The influence of Christianity on poetry has been great in any area that Christianity has taken hold." The journalist and ex-atheist Peter Hitchens, who is the brother of the late atheist Christopher Hitchens, said upon seeing an art exhibit of Michelangelo's painting The Last Judgment he came to the realization that he might be judged which startled him. This started a train of thought within Peter Hichens that eventually led him to become a Christian. Inspiration is important as far as producing quality poetry, art and music. Atheist Francois Tremblay wrote: "One last problem that undermines any propagation of atheism is inspiration. Let's be honest here, "there is no god!" is not a very motivating call for most people." (See also: Atheism and inspiration). At the present time, global atheism is shrinking in terms of its world percentage of adherents (See also: Desecularization). ↑ [http://www.amazon.com/s/ref=nb_sb_noss?url=search-alias%3Daps&field-keywords=atheist+poetry&rh=i%3Aaps%2Ck%3Aatheist+poetry Amazon - search results for the term "Christian poetry"
↑ Pandian (1996). India, that is, sidd. Allied Publishers. p. 64. ISBN 978-81-7023-561-3. Retrieved 2011-04-09. This page was last modified on 7 May 2016, at 12:33.